Bridget O’Shannessy: “A lot of teenagers are embarrassed or afraid about expressing their faith”. YOUNG Brisbane country gospel musician Bridget O’Shannessy’s wants to encourage young people to be bold in expressing their faith to the world. The 14-year-old singer and songwriter said she mainly writes her songs for young people struggling to be true to their faith. “A lot of teenagers are embarrassed or afraid about expressing their faith,” Bridget said. But she encouraged young people to be themselves, dream big, and love their Catholic faith, which has been a major inspiration for young musician. The Brigidine College student and Our Lady of the Rosary parishioner said both her Catholic communities have inspired her to write faith-based songs. “I go to Mass a lot at Kenmore, and the stories they tell are amazing,” Bridget said. She has recently released a song called Footprints, based on the popular Christian poem, Footprints in the Sand. She said every aspect of her career is marked by her Christian faith. “To me, Christianity is about loving one another as Jesus loves us, and I try to do that in my music, songwriting, and in meeting people everyday,” she said. Bridget said she loved country gospel music because it was a different subgenre that allowed her to express her faith and to share positive messages. 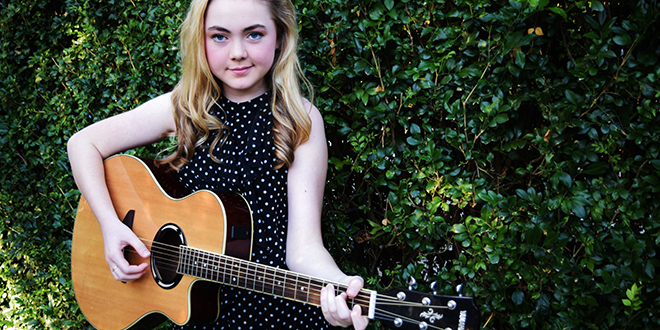 Bridget has been performing and writing music since she was 11. Her maternal grandfather was responsible for introducing her to country music, while her great aunt was also a Sister of Mercy and former music teacher at All Hallows’ School, Brisbane. She has performed various festivals including the Urban Country Music Festival in Caboolture and the Tamworth Country Music Festival. In January this year she attended the CMAA Academy for Country Music in Tamworth, to learn from some of the country music industry’s best. Bridget is working with a small team of family and fellow musicians to create and promote her music. She said she wants to become a “household name in country music” while remaining true to her self and her faith.